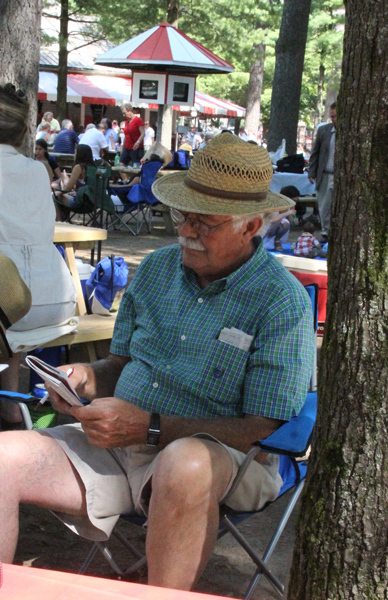 "John Pricci's Saratoga Diary" began at "Newsday" in New York and is the oldest, continuously offered feature column covering the world's greatest race meet. John's Diary offers his own unique perspective on the thoroughbred sport's best horses and races and how Saratoga racing and events effects the sport nationally. While the art of handicapping is a satisfying intellectual pastime, a pursuit that is an end in itself for many racing fans, it serves a singular function for the game's pragmatists; to increase personal wealth by maximizing the worth of one's opinion. It is how horseplayers keep score. Unlike random casino games, picking winners and knowing when and how to bet them is, like poker, a learned skill based on analysis of predictive data: The element of speed, for instance, the time it takes horses to run from gate to wire, is absolute. Easily quantifiable, speed is vital to the success of horses and gamblers alike. But handicappers do not live on speed figures alone. The surface over which a horses race, its ability to excel on grass or dirt, wet tracks or dry, is another known commodity that serves as a functional predictor. Breeding and confirmation, from the size of a horse's heart and hoof and its lung capacity, relate to its propensity for success under stressful circumstances. Other notable handicapping tenets include trainer tendencies, the equine coaches known to the community for their talents and shortcomings alike, and the relative talents of the game's most recognizable horsemen; jockeys, the most under-appreciated athletes in sports. Successful riders are more pilot than passenger; they are the architects of victory. How a contest develops, or race shape, is the variable of study for visual handicappers with an eye for dissecting how a horse's journey ultimately effects its performance and the overall result. Class, a concept not simply defined but demonstrably recognizable, refers to the animal's ability to reveal grace, tractability, economy of motion and courage under pressure. And, of course, racing luck, a truly random event and why they call it gambling. Whether a well heeled professional or weekend warrior, the successful practitioner need only collect readily available data and assess those elements that reveal the most likely outcome. But this knowledge has no utility in a vacuum, it must be coupled with knowing when and how to bet. One learns from sports that winning is not brain surgery but a matter of execution. Bettors cannot succeed without execution but they cannot execute without a sensible game plan befitting their bankroll and temperament. Back in Seabiscuit's day, racing's experts believed that you could beat a race but not the races. But with multi-race wagers largely responsible for annual U.S. handle of $15 billion, today's successful players take the opposite tack. Modern bettors have learned to leverage their wagers, knowing that their best chance is to put their eggs in more than one basket. They do not hesitate to spend money to make money. Think of it as a pari-mutuel hedge fund. The quickest albeit most challenging course to riches is playing in multi-race pools like the Pick Four and Pick Six, or in tiered intrarace wagers such as the superfecta. In each case windfall payouts is a reward for predicting when more than one thing will happen at the same time. Contrary to traditionally straightforward win, place and show wagers, exotic bets exist because of one immutable fact; the higher the degree of difficulty, the bigger the payout. The bigger the payout, the greater the ability to withstand the inevitable losing streak. As an aside, America is far behind the rest of the world when it comes to super-exotic wagering. In Sweden, a nationally televised Pick Seven routinely attracts weekly handle of $10-million with payoffs of $3-million to $6-million commonplace despite a huge parimutuel hold of 35 percent. The "First Four" is the most popular exotic wager in Australia. Here, the superfecta trails the exacta, trifecta, Pick Three and Pick Four in popularity. The Quinte (first five) is France's favorite bet. Now in its second decade, the Pick Four is this country's fastest-growing super-exotic wager everywhere but in California, the American birthplace of Pick Six. While Pick Four payoffs occasionally reach Pick Six proportions, it continues to gain popularity because of its greater affordability and availability. Indeed, many of today's successful Pick Four players are former Pick Six bettors. Pick Four players made the switch because they can buy more combinations for less in a larger pool, carryovers notwithstanding. A Pick Six consisting of three horses in four races with stand-alone horses, called singles, in the two remaining legs costs $162. A Pick Four using three horses in the first three legs and a single in the fourth costs $27. That same $162 Pick Six investment buys six Pick Four wagers. That's a lot of leverage. Pick Four players with a Pick Six mentality will wager large amounts to buy multiple tickets, using key horses in the more predictable legs and spreading with many horses in the most difficult races. This type of flow provides greater coverage and an opportunity to boost profits by including extreme longshots while optimizing on stronger opinions. Winning super-exotic bettors do not and should not embrace a win-at-all-costs mentality. They expect to lose far more often than they win, but when they win they expect to get paid handsomely. At best, super-exotics can result in life-changing scores; at minimum they keep players in the game. And with apologies to singer-songwriter Steve Forbert, you cannot win if you do not play. Identify True Odds On Top Choices: Only after assessing your choice's real chances to win can you know with certitude if a race is playable. Simply stated, if you believe Secretariat would win a race 50 of 100 times, fair odds would be even money, a $4 return for every $2 investment.But at odds of 3-5 yielding a 60 percent return on investment, he would be a $3.20 underlay and not commensurate with the risk. At 8-5, however, he would return a profit of 160 percent profit. The $5.20 overlay would be a good bet. A $20 winner might look like a longshot but it does not provide value if its real chances to win are six of every 100 starts. That would require minimum odds of 15-1, a $32 win payoff. Optimize Your Opinion: Within a consistent framework and betting comfort zone, wager a greater amount when your opinion is strongest and value is available. On balance, popular boxes and wheels do not optimize opinions or profits and are poor wagering strategies. Stay away. Jump In The Pool Providing Greatest Value: Mistakes are unavoidable, but handicapping or wagering errors in exotic pools create huge payoffs due to the inefficiencies that occur in more than one finishing position. Windfall profits are a strong possibility given this scenario. Want some unconventional betting advice? Read our Top 10 Tips For The Trackies!